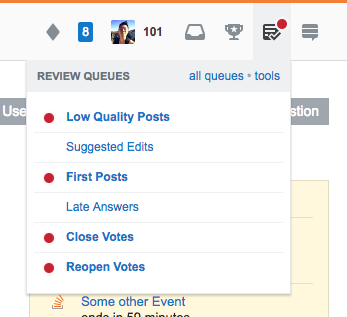 Turn on the review queue indicator whenever there's a task available in any queue. This will mean you'll be notified of outstanding tasks you can't clear. We are aware of a problem that people will be notified of queues that they don't have the privilege to access. That's next on the list to fix. The goal is to be more aggressive with the indicator to see if we can clear tasks more quickly. Please let us know if we've gone too far. And in general, we're interested in any feedback to this change: positive, negative or noncommittal.